Healthy Mock Breaded Cauliflower is crispy and delicious, without all that fat! It’s Chanukah now, which means that most of my readers, particularly the Jewish ones, will be expecting all kinds of deep fried delicacies to appear on the front page of this blog. After all, what kind of good Jewish girl isn’t making latkes and donuts now? Okay, so I won’t go so far as to say that I am not making any fried goodies this week. In fact, I have a whole bunch of deliciousness up my sleeve, (or in my frying pan, as the case may be). Hopefully, those will be here soon. But in the meantime, I figured I would preempt the unhealthy treats with my latest veggie creation. I think obsessed is a very strong word, but I did make this three times in the last week. Let me explain. I have a pet peeve about super unhealthy vegetable dishes. Don’t get me wrong, I love to eat them. But I hate when people eat deep fried and breaded vegetables and pat themselves on the back for having a healthy meal. One of my favorite such dishes is breaded cauliflower. Super thick breading which is crispy from the deep frying process…and you can barely tell you are having a vegetable. That’s not the case with this cauliflower. I admit the aforementioned dish was the inspiration for my healthy breaded cauliflower, but the end result is not something that will cause you to feel guilty for hours afterward. 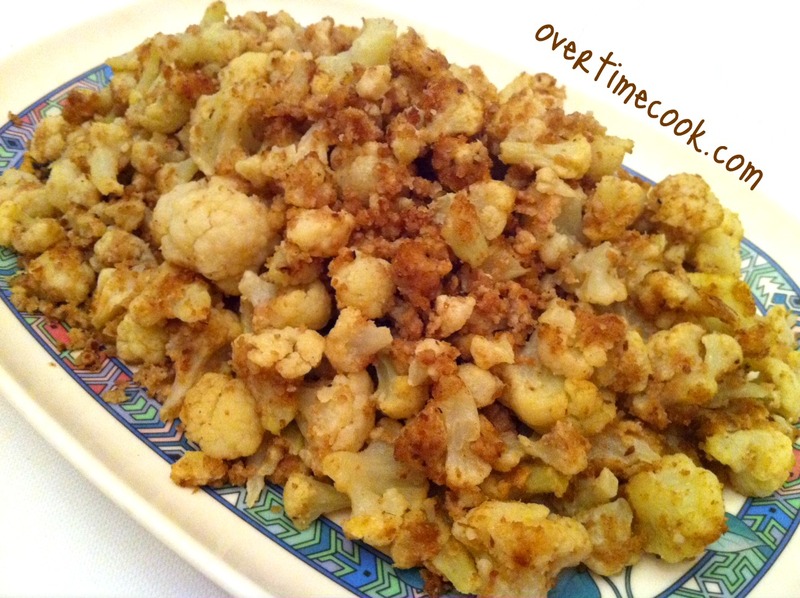 In a large mixing bowl, toss the cauliflower, oil and spices to combine. Add bread crumbs and toss until completely combined. Add egg and stir well to evenly distribute the egg. The entire mixture should be sticky at this point. Pour mixture onto lined cookie sheet, and spread into a single layer. Bake at 400 degrees for 30-40 minutes, until slightly crispy. Stir approximately every 10 minutes to make sure it doesn't stick. Sincere best wishes for a joyous and happy Chanukah to you and yours. Your cauliflower looks very appetizing. Sounds delicious. I love cauliflower, and this looks like a great way to spruce it up. Now if only it would go on sale…! I compromised on the fried unhealthiness by making falafel! Oh man these look tasty! Wish I’d seen them earlier. I made brisket and potato kugel for the last night of Hanukkah on Tuesday. I’ll be making these in January though for sure – my fiance and I are going vegetarian for a month! I have a feeling we’ll be eating a lot of these. Thanks for the post! Thanks Annakate, I’m glad you like the recipe! mmmm. looks yummy. Are you using fresh bread crumbs, or dried? I’m glad you like this dish! I used dried breadcrumbs from a package. Made this tonight – it was easy-peasy and very yummy! Even my non-cruciferous-vegetable eating husband loved it! I made this for Friday night. 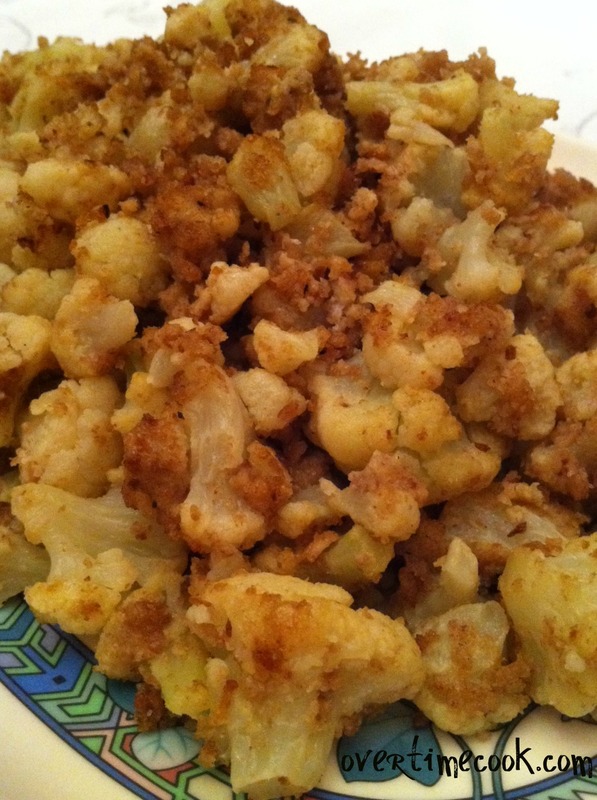 This is the second cauliflower dish you posted that was a huge hit with my family. It’s delicious and so quick and easy to make. Yummm… just made this yesterday and it was so good! Was a great & simple recipe! Just cut the cauliflower up and use as directed. I’ve heard from people saying its even better that way! Well, I beat you in the healthiness department. I’m.devouring a can of beets while reading this. Pun unintended. Btw, why are they called MOCK breaded? These were fantastic, couldn’t get enough of them. I had a craving for breaded cauliflower, and totally did not miss the deep frying. This recipe is a definite keeper. can i use fresh cauliflower or does it have to be the frozen kind? Can I make this 2 days in advance? How many cauliflower heads is 24 oz? can it be any crumbs? reg bread crumbs? corn flakes crumbs? Made this for supper last night – was a huge hit!!!! Thanks! Sounds wonderful. Can you use matzoh meal so kosher for Passover? I just wanted to thank you for this wonderful recipe ( and so many of your others!)! I make this all the time and my family loves it! Does this dish freeze well? delicious! husband loved it!! it was a drop too salty probably because i put in spiced bread crumbs. Thank you so much for the great recipe. Thank you so much. One of my kids is vegan. Does it work w/o an egg?